Mark your calendars for Thursday April 7th (6:30-8:00) in the school cafetorium for a PTA sponsored information night about the latest developments on Smarter Balanced testing. Gwen Sullivan (PAT President) and Mary Anderson (PPS Assessment and Educational Measurement) will present the most up to date information about the test to help you decide whether or not to opt out your child. Gather the facts about what’s different this year compared to last and also learn about some big changes to assessments (statewide and districtwide) that will hopefully be coming our way. Already know you want to opt out your child? Fill out this form and hand it into the main office. (Testing begins Mid-April). Buckman will host a screening of the movie “Screenagers: Growing up in the digital age” on April 19, 2016 at 7:00 pm. Tickets are free for Buckman parents; proceeds from tickets purchased by non-Buckman families will benefit the school. Both free and paid tickets must be ordered for admission. Secure your spot now online. 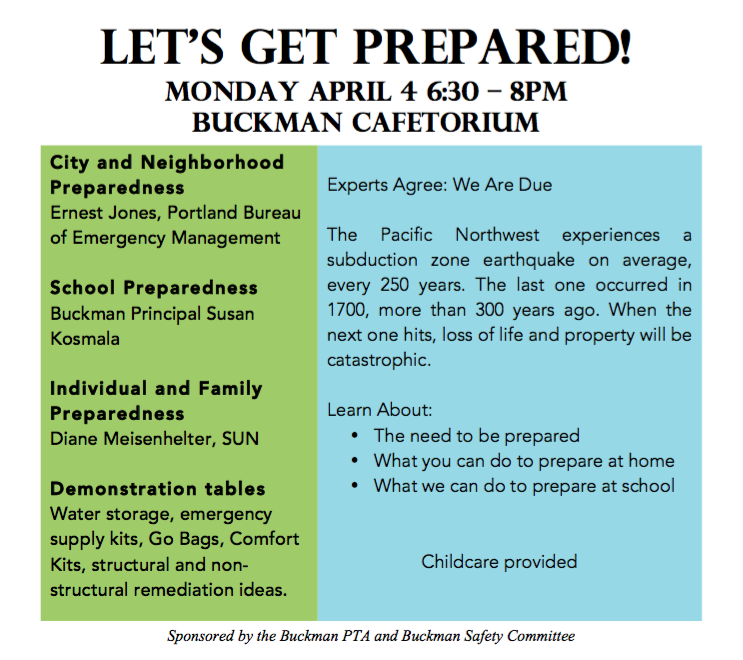 Buckman will be hosting an Emergency Preparedness Fair on Monday, April 4, starting at 6:30pm. 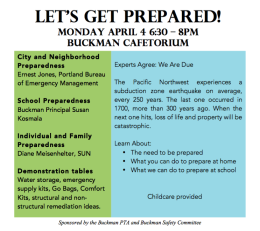 Families can come and get information and resources for making a Family Emergency Plan as well as learn about how our school is trying to prepare for the possibility of an emergency. Art Show and Sell Is This Weekend! Don’t forget to attend this year’s Art Show and Sell, coming up THIS WEEKEND, March 12-13. Over 140 artists and craftspersons will be there selling original artwork, furniture, toys, jewelry, textiles, paper creations, photography, paintings, ceramics and more! There will also be live music, food carts, and art activities throughout the day. More information is available at the Art Show and Sell website. You can also get a sneak peak of some of the amazing items that will be up for sale at the Art Show and Sell Facebook page. Saturday’s line-up will feature the Art in Action series, with speakers, events, and activities. On Sunday, Buckman’s own dance, choir, and marimba groups will perform. Full details on the schedule are here. Proceeds from the event go in part to support the Buckman PTA. Don’t miss this wonderful opportunity to support our school and our community! First 30 minutes was social time with pizza served to anyone interested. Frances Kappes made a motion to approve minutes, Krista Hofmeister seconded the motion. Meeting minutes approved. PTA purchased a gift certificate to a spa for Ms Dewson as a Thank You for jumping in to take over for Mr Rockness. Frances explained the role of the Foundation and the different events throughout the year that fund the Foundation. Auction is going great. All committee positions are filled but will be a need for more volunteers as we get closer to the events. Call for volunteers for the day of the event. Check the Sign Up Genius forms to pick a volunteer job. Please like the Buckman ASAS on Facebook and invite your friends to the event. New this years is ASAS on Instagram showing photos of artist’s work – both student and professional artists. Follow Buckman Art Show and Sell on Instagram! Need two more people February 10th stuffing envelopes from 9:30-12. Contact Michelle if you are interested. On Feb 25th from 6:30-7:30 pm at Teote Restaurant there is final meeting before the ASAS to discuss status across committees and to tease out any work that still needs to be done. There will be a community meeting next week at Buckman to discuss hiring of new principal. If you would like Ms. Kosmala to stay, please send letters and email in support and come to the meeting next week to show your support. Please refer to attached information sheet (and upcoming newsletters/emails) to find out more information. Margaret handed out this year’s Opt Out forms along with a letter from the President of the PAT, Gwen Sullivan explaining how Oregon would like to be chosen for a Pilot Program to implement alternative assessments in place of Smarter Balanced. If you would like to Opt Out your 3rd, 4th and 5th grader, please fill out the paperwork and hand in to the main office. Sarah Suby introduced Lisa Lyon from Decoding Dyslexia. Lisa shared her personal experience dealing with her child’s dyslexia and explained the mission of Decoding Dyslexia – to raise awareness, empower families, influence policy and help kids. A brief video was shown explaining what dyslexia is. There was then a slide show presentation about dyslexia. Another parent from Decoding Dyslexia shared her story of navigating PPS with a child with dyslexia. There was a call to action to encourage teachers to educate themselves around dyslexia so that they can better help identify kids at risk. The 1st Monday of each month at Providence Portland/Medical Center there is a meeting for educators and parents to learn and discuss relevant dyslexia topics. Recently Oregon legislation has been passed to mandate more screening for dyslexia in schools and more training of educators to identify dyslexia. What to do if you think your child has dyslexia? A list of private as well as public services were identified. For any questions or more information, contact info@deocingdyslexia.org. Wendy Marich adjourned the meeting at 8:05. PTA has spent 17k so far this year. We have about 56k left. Majority of the $$ was spent on the library fund (new books for library), extended responsibility fund for arts specialists, donations to the clothing center and the student aid fund. Vote to add line item to the budget. The amount of money alloted to Mr Simmons by the PTA last year was inadvertently drawn from the school fund instead of the PTA fund. Hilary proposed to add a line item to this year’s budget in the amount of 2,500 to reimburse the school fund for last years expenditure and for some SPED expenditures. It was proposed that the line item is called, ‘Reimbursement of Funds as Budgeted for 2014-2015′. Cara Althoff made a motion to approve. Angela Kirkham seconded. Motion passed unanimously. Meredith Voorhees needs volunteers for clothing center. Please consider volunteering your time. Split shift is ok if you cannot stay the whole time. The clothing center provides clothes to children of families in need at no cost. Families ‘shop’ at the clothing center and volunteers assist families in finding clothes that suit them. Side note: For families wishing to donate – Any clothes in good condition can be dropped off at Buckman main office where they will be delivered to the clothing center at Marshall High School. Call for artists has closed and art show team is now reviewing/choosing which artists will participate in the show. ASAS is looking for a full service espresso cart to come to the school for the duration of the show. They are also looking for two more bands/musicians to play. Contact Michelle if you know of anyone. Many key volunteer positions will be vacated this year as families graduate out of Buckman. We need volunteers to shadow current committee heads this year so next year those positions are covered. Most notable positions include, Dines Out and Auction Chair. Contact Frances if you are interested. The Direct Ask Campaign is launching this week and will run for the month of December. A group of 15-20 parents has pledged to donate $8,000 if the Foundation can get 70 additional donors to give any amount of $$. The upcoming book fair needs volunteers. Before and after school, in the morning and in the evening. BeSmart is a branch of Moms Demand Action For Gun Sense and volunteers presented materials that were informative and non-political. Their goal is to reduce unintentional shootings and gun deaths that can occur when households have guns that are unsecured. They identified 5 steps that every person (whether you are a gun owner or not) can take to be safe. S – secure guns in homes and vehicles. M – Model responsible behavior. A – Ask about unsecured guns in other people’s homes before you child goes on a play date. (Consider email or texting the other family in order to help with potential awkwardness). R – Recognize signs of teen suicide. T – Tell peers to be SMART and spread the word.